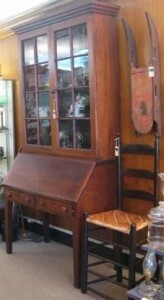 Kentucky antique furniture boasts some stunning handmade pieces from the 19th Century. In particular, look for quality cherry wood pieces with inlay. For less formal décor, country furniture in old and original paint is plentiful and affordable, often costing less than new furniture! Kentucky is quite well known for its Shaker Furniture. The Shakers were a religious community established in the 1800’s in Kentucky that flourished for more than 60 years. They lived a peaceful, communal life, and their furniture craftsmanship is second to none! Clean, simple and functional design reflective of the Shaker way of life, is especially attractive to collectors and design enthusiasts. Fun old farm pieces that have been repurposed make affordable furnishings with history, charm and a touch of whimsy. Our favorite finds are an old chicken coop made into a coffee table and an antique cobbler’s bench as a side table. Yellowware – old mixing bowls with a yellow glaze with various bands of colors. Clark & Hinton, Paris, KY, circa 1855. Concentrating on a particular maker for Kentucky coin or antique silver will help focus your collection so you can invest in quality pieces. Coin silver teaspoons make a good starting point for a collection, while serving pieces can be more difficult to find and more expensive. Kentucky antique quilts are some of the best antique textiles on the market. Early 20th Century examples can still be found in affordable prices. Look for quilts that are in good condition without tears or stains and look closely at the stitching. Tight, hand stitched blocks and seams indicate quality, and the more intricate the patterns, generally the higher the price tag. Kentucky antiques offer a good, old-fashioned dose of Americana at its best. While antiques can make a sound investment when you buy quality pieces, investing in items that you’ll cherish is the best pay off!